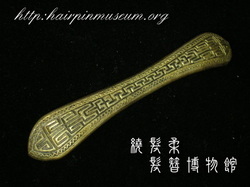 This is an example of a symmetrical, spoon-shaped hairpin like the ones seen in the catalogue page on the left. A flower hairpin (above) that is similar to number 3 in the catalogue page on the right and a geometrical design like number 6 (below). 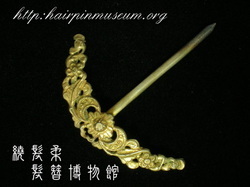 A "golden flower" crescent moon-shaped hairpin like numbers 2, 4 and 5 on the right. 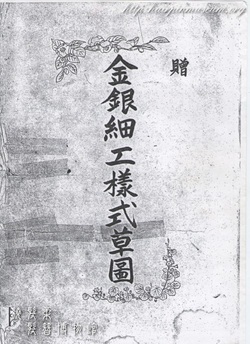 A hairpin ending in a hand holding a flower like numbers 2 and 3 (right). 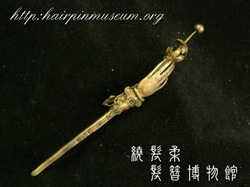 This hairpin originally had a round glass bead that is now missing. The one below is almost identical to number 1.